May12May 12, 2014 • By milkandbun • This entry was posted in Breakfast, Cookies and tagged baking, blog, Blogging, breakfast, Cheddar, cheese, chili, cookie, cookies, cookies recipe, cooking, food, food and recipes, food photo, food photography, leek, onion, onion cookies, photo, photography, photos, recipe, recipes. Bookmark the permalink. I love that you’re calling these cookies! 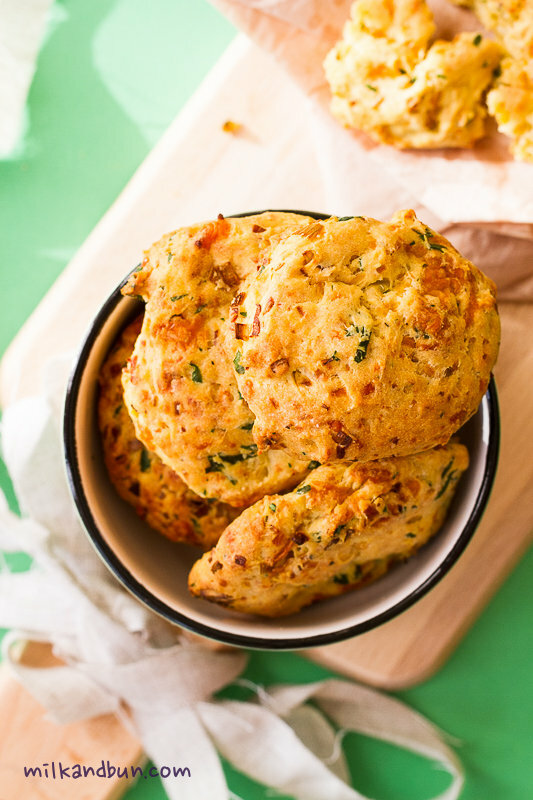 And for some reason the spelling of chilli with 2 “l”s (first saw that in a Jamie Oliver book) I like better than our American spelling “chiles.” A chilli cookie is my kind of breakfast because I love savory spicy (and cheesy) goodies rather than sweets usually. Do you put any butter on these? I do agree with you, Ngan; they goes well for late (and lazy) breakfasts or brunches. Wow these sound so good! I’ve never heard of savory cookies before, just sweet ones. It makes me think of biscuits. The flavors sound wonderful and I’m sure I could easily adapt to make vegan if I get a chance. Thanks for the inspiration! Cheese and onions – how can this not be good?! 🙂 Looks great! Never in my life have I had a savory cookie! What a great idea. And chili’s and onions are such a great idea in this. It sort of reminds me of a savory biscuit. I love the recipe. Great post. Oh they look delicious, I’ll take mine with some fluffy scrambled eggs please!! 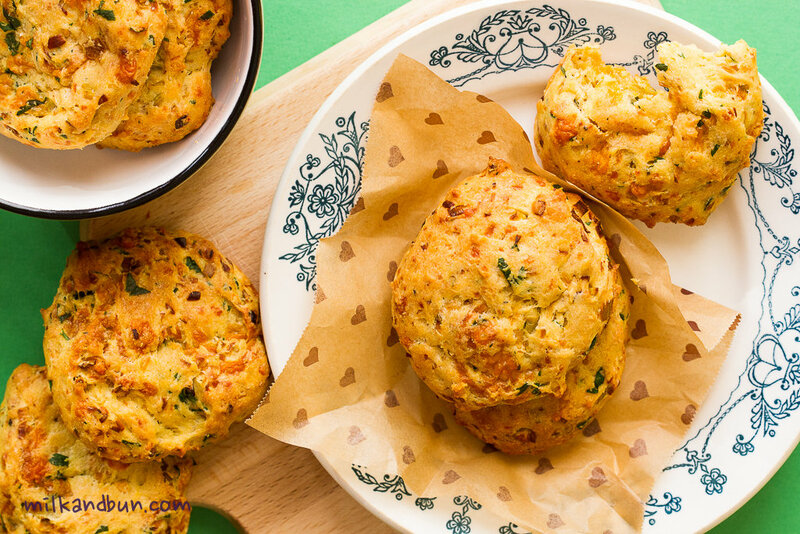 Oh my goodness – these are such a good idea – a savoury cookie for breakfast – I’m in! Thanks for joining the party and bringing these brilliant cookies! Wow! They look like a biscuit scone and gougere all combined! Delicious! They would be a great appetizer, too! I hope you do give it a try one day. 🙂 The cookies are really very good, especially freshly baked and hot! hahaha 😀 Thank you, ChocChipUru! That’s such a unique breakfast cookie. Great! And delicious! 😀 Thank you, Anjana! Those “cookie” are great! I bet the taste has to be amazing! I call it cookies 😀 Thanks for stopping by! I absolutely love your savory baked recipes. I really want to try this for a change from the sweet stuff. What do you use to mix the cold butter and dry ingredients together? Hi dear Lily! I’m so sorry for the late respond, way away from blogging.. but I came back! 🙂 I usually mix cold butter cubes in a food processor-just pulse couple of times or rub it with my hands! 🙂 You can also do it on a flat surface with a sharp knife. And then I mix in all other ingredients.